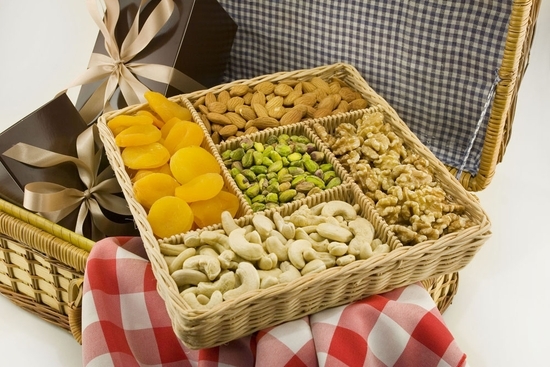 Apricots, Pistachios, Almonds, Cashews and Walnuts. The contents of the gift basket were very desirable and appreciated by my friend. But the delivery was very poorly carried out. It was left at the door of a residence where everyone was out. Had the resident not returned later the package could have been stolen or at least damaged by weather. For this reason alone I would not repeat ordering or sending this edible gift. I purchased the 3.5 nuts for a local DR. as a thank you and he wanted the web site because he said they were quite nice. So even though I didn�t actually see them first hand I take his word they must have been nice. This basket was a gift for my mom for mother�s day. as soon as she got it, she called me to say that they were beautifully presented and VERY FRESH!